The “Achieving Smokefree Aotearoa by 2025” Action Plan was launched at Parliament on 2 August. A previous blog described its key features and a rationale for the recommended measures. This blog addresses critiques of the Plan; it discusses the potential role e-cigarettes could play in achieving the Smokefree 2025 goal and examines how measures in the Action Plan will support people who smoke to either quit or to transition fully from smoking to vaping. Smokefree Aotearoa 2025 is a world-leading tobacco-control goal with origins in the vision of Māori leaders for a Tupeka Kore (tobacco-free) Aotearoa, freed from the tobacco products introduced to Māori through colonisation. This goal envisages a society where people no longer suffer the health, social, economic and cultural harms caused by tobacco smoking. A team of researchers from ASPIRE 2025, supported by leading researchers and practitioners in the tobacco control sector, prepared the Plan – “Achieving Smokefree Aotearoa by 2025”. An accompanying progress report found the goal will not be achieved if current trends continue, and will be missed by a wide margin for Māori and Pacific peoples, thus supporting the urgent need for a plan. A previous blog described the key features of the Plan and set out a rationale for the measures suggested. These aim to reduce smoking prevalence by making smoked tobacco products less affordable, less available, less appealing and less addictive. Critics have argued that the Plan represents an abstinence-only (‘quit or die’) approach to tobacco control, and that a harm-reduction approach prioritising better access to alternative nicotine-delivery systems, such as nicotine-containing e-cigarettes, would be more effective. Another claim is that the measures could be excessively coercive and disempower smokers. We believe these assertions are misplaced, and discuss why below. Is the Plan aiming for total nicotine abstinence? The assertion that the Action Plan has a goal of total nicotine abstinence is incorrect. The Plan endorses the Government’s goal of reducing smoked tobacco use to minimal levels by 2025, and defines this goal as less than 5%, and as close as possible to 0%, daily smoking prevalence. It does not mention nicotine abstinence. In fact, the Plan sets out how greater availability of alternative nicotine-delivery products will complement the implementation of a comprehensive, evidence-based set of established and innovative tobacco control measures. It recommends the planned increase in access to nicotine e-cigarettes is implemented alongside providing complementary information on e-cigarettes (eg, relative harms of e-cigarettes vs smoked tobacco products) and improving smoking cessation support, including support for existing nicotine replacement therapies (NRT) and e-cigarettes as a quitting aid. The debate about policy and regulation of alternative nicotine-delivery products centres on ‘how best’ to develop policies that ensure optimal population health outcomes while minimising potential unintended impacts. The National-led Government announced in 2017 that it will introduce a pre-market approval system for smokeless tobacco and nicotine-delivery products, which may make these products more widely available. However, we focus here on e-cigarettes, the first generation of alternative nicotine products, as this Government has committed to making nicotine-containing e-cigarettes more widely available. We set out some possible benefits and harms of making e-cigarettes more widely available in Table 1. E-cigarettes used as cessation aids help smokers to quit. Results in increased successful quit rates. Smokers who might otherwise have quit smoking altogether instead adopt long-term ‘dual use’ of e-cigarettes and smoked tobacco products. Results in reduced quit rates. E-cigarettes act as an alternative for some smokers who cannot or do not wish to stop using nicotine resulting in transition to a reduced harm product compared to smoking tobacco. Social, economic and cultural costs of maintaining addiction to nicotine among smokers who switch to e-cigarettes (which is still substance addiction, even though the health effects are less serious than for tobacco) instead of quitting smoking entirely. E-cigarettes reduce smoking uptake by replacing tobacco products among young people likely to start smoking. E-cigarettes increase smoking uptake by acting as a ‘gateway’ to starting smoking for children and young adults. E-cigarettes reduce second-hand smoke exposure by reducing overall smoking prevalence. E-cigarette uptake among children and young adults exposes them to adverse health effects (though likely much less severe effects than for smoked tobacco products) as well as social, economic and cultural costs of maintaining addiction. Current evidence (see below for some examples) suggests that the overall impact of e-cigarettes will be positive, and that the benefits will be greater than the harms. However, discussion is needed on how e-cigarettes and newer products should be regulated (eg, where they can be sold, and the extent of controls on marketing and flavours) so that the potential benefits are maximized and risks minimised. For example, there are at least two distinct approaches to policy with regards to increasing nicotine-containing e-cigarette availability, with arguments for and against both approaches. E-cigarettes could be made widely available with largely unrestricted access, eg, by allowing sales in most retail settings, including dairies, petrol stations and supermarkets. The main argument in favour of this option is that compared to a more restricted increase in availability, it may maximise use of e-cigarettes by smokers as an aid quitting or as complete substitutes for smoked tobacco products among those who want to continue to obtain nicotine. An alternative approach is to make e-cigarettes more available, but with some restrictions. For example, one option (and there are many others) discussed in the Plan’s rationale section, would be to allow sales only in specialist vape shops and pharmacies, as both stores have (or could have) staff trained in using e-cigarettes and smoking cessation. The arguments in favour of this approach are that compared to largely unrestricted access it may enhance the successful use of e-cigarettes by ensuring that smokers buy them at locations where they will receive expert advice about their use (which device, which strength of e-liquid etc) and support for quitting smoking. Also, this option may minimise the risk of children and young people experimenting with or becoming regular users of e-cigarettes. The Action Plan makes it clear that the positive impacts on health of e-cigarettes will be enhanced and adverse effects minimised, not just by getting the regulatory context right, but also by implementing tobacco control measures that encourage e-cigarette use relative to smoked tobacco products. That is, the positive impacts of e-cigarettes are likely to be much greater if e-cigarettes are more affordable, more available, and more appealing, relative to smoked tobacco products. This differential will ensure that smokers continue to have strong reasons to quit smoking and that those who don’t want to quit using nicotine will be encouraged to transition compeletely from smoking to vaping. Ongoing increases in tax on tobacco products, but not for e-cigarettes, ensuring that e-cigarettes become cheaper over time relative to tobacco products. E-cigarettes – could they get us to Smokefree Aotearoa 2025 on their own? Some academics believe that greater availability of e-cigarettes (and related products) will be sufficient to achieve the Smokefree 2025 goal, and that further restrictions on smoking, increases in tobacco taxes, or controls on tobacco products are unnecessary. These are beguiling propositions, not least because the argument that e-cigarettes may increase quitting among current smokers is intuitively logical (1,2). However, the evidence that this outcome will occur is less clear and remains contested; we thus believe that relying only on greater availability of e-cigarettes to achieve the 2025 goal has a very high risk of failure. On the positive side, there is some evidence from trials, including a NZ study, that e-cigarettes can be effective smoking cessation aids, and at least as effective in supporting smoking cessation as nicotine patches (3,4). Furthermore, the NZ study used very early ‘cigalike’ e-cigarettes that look like traditional cigarettes, but are not very effective at delivering nicotine, so may have produced conservative findings (4). Positive impacts of e-cigarettes on quitting may be greater in settings with less restrictive regulatory environments for e-cigarettes (5). Recent declines in smoking prevalence in the UK and USA (where nicotine-containing e-cigarettes are widely available and commonly used) that coincide with increases in e-cigarette use are consistent with a positive population-level impact of e-cigarettes on smoking prevalence, although other explanations are possible. For example, a 2017 US study reported the first increase in the population quit rate for almost 25 years (6). The increased quit rate was restricted to e-cigarette users, suggesting that e-cigarettes were an important explanatory factor, though concurrent sustained, high-intensity mass media campaigns may also have contributed. Two studies from England estimated that e-cigarettes resulted in between 16,000 and 22,000 additional long-term quitters in a year, but this range is only equivalent to 0.19 to 0.26% of UK smokers (7,8). This view is supported by modelling studies that suggest greater availability of e-cigarettes is likely to reduce smoking prevalence, though the projected impacts are often modest (9). The problem is that these estimates of impacts on smoking prevalence are quite small. A much greater proportion of smokers (10% per year overall and almost 18% per year for Māori) in New Zealand need to quit in order to achieve Smokefree Aotearoa 2025 (see the Progress Report accompanying the Plan for more detail). Hence, even with the most optimistic assumptions about the positive effects of e-cigarettes on smoking prevalence, these are not nearly sufficient to reach the 2025 goal. In summary, although greater availability of e-cigarettes seems likely to reduce smoking prevalence, these reductions are very unlikely to be sufficient to achieve the Smokefree 2025 goal, particularly for Māori. The Action Plan instead adopts a dual approach that includes making nicotine-containing e-cigarettes more easily available as well as recommending additional measures that will reduce smoking uptake, encourage smokers to quit, or switch completely to e-cigarettes by making smoked tobacco products more expensive, less easily available, and less appealing and addictive. Coercive and disempowering for smokers? Another possible criticism of “Achieving Smokefree Aotearoa by 2025” is that some of the key measures could be seen as coercive and disempowering for smokers who continue to smoke. We agree there is no place for approaches that deliberately marginalise or stigmatise smokers. Interventions such as enhanced smoking cessation support that effectively promote and empower smokers to quit should be supported, and are included in the Plan. Here we consider the arguments for perhaps the most contentious measure in the Plan: ongoing increases in tobacco tax. The Plan recommends larger annual increases in tobacco taxation (from the current 10% annual increase to a 20% annual increase for three years). We note that any measure to prompt and support quitting could be argued to empower most smokers as around three-quarters of New Zealand smokers want to quit (Edwards et al, unpublished data from 2016-2017 NZ ITC study), over half have tried to quit in the last year, and over 80% regret starting (10,11). That said, we acknowledge that raising tobacco taxes will have adverse economic effects for some smokers who continue to smoke (see section below). Despite this likely outcome, we believe there is a strong justification for tax increases on public health grounds. Firstly, there is extensive evidence that tobacco tax increases reduce smoking prevalence by decreasing smoking uptake and promoting cessation, with greater impacts on disadvantaged populations since these groups are more price sensitive (12). Smokers who quit due to tax increases, or children and young adults who never start because of the tax increases, will see substantial positive financial impacts. Secondly, greater availability of e-cigarettes – which the Action Plan supports and that are not taxed – will provide a cheaper alternative nicotine source and further help mitigate negative impacts of tax increases. Furthermore, tobacco tax increases will give smokers who do not want to quit using nicotine products to move to cheaper (and less harmful) e-cigarettes. Thirdly, some smokers who do not quit immediately in response to tobacco tax increases may cut down on their smoking (13,14), which will help mitigate negative financial effects, although the health benefits may be minor. Fourthly, the Action Plan states that tobacco tax increases should be accompanied by the provision of high quality and accessible smoking cessation support. This support should be specifically targeted to low-income, Māori and Pacific smokers, and funded from the additional revenue that the Government receives from tobacco tax increases. This measure will help empower smokers to quit, maximise reductions in smoking prevalence and ensure that smokers have access to appropriate support to quit. Greater availability of e-cigarettes and improved cessation support will reduce the adverse financial impacts of the tax increases. However, the impact of the tax increases on smoking prevalence and on smoking and the financial circumstances of disadvantaged population groups needs to be closely monitored to assess if the policy continues to be justifiable. We also assessed the extent to which smokers themselves support tax increases and other measures in the Plan that could be considered potentially disempowering for people who currently smoke, as detailed below. Do smokers support or oppose the Plan’s measures? The short answer is: there is substantial support for most measures, even among smokers (support is much stronger among non-smokers). Table 2 below suggests that with the exception of tax increases, around half or more of smokers surveyed support all of the key measures included in the Plan. However, most smokers support tobacco tax increases if the additional revenue collected is used to help smokers to quit. Very high proportions of smokers support smokefree cars and reducing nicotine in tobacco. High levels of support for the measures in the Plan provides further justification for their implementation. Furthermore, we believe support for measures in the Action Plan is likely to increase further, provided the policy and its rationale are well-communicated as is recommended in the Plan. For example, support for the 2003 Smoke-free Environments Amendment Act increased greatly as the nature of, and reasons for, the policy was communicated before implementation and after implementation as people experienced its benefits (15). 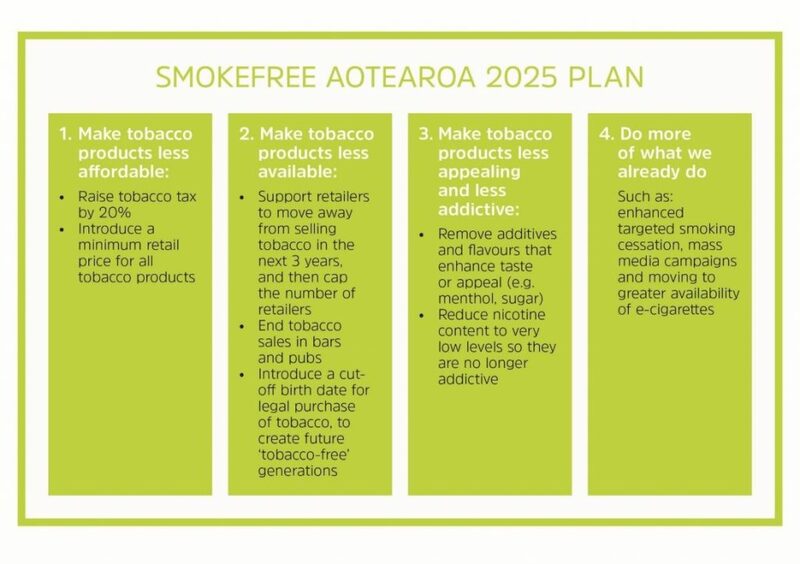 The “Achieving Smokefree Aotearoa by 2025” Action Plan sets out an evidence-based, logical approach to ensure the Smokefree 2025 goal is achieved for all peoples in Aotearoa, including Māori. Measures to make smoked tobacco products less affordable, less available and less appealing are coupled with increasing access to e-cigarettes to further support quitting and provide an alternative for smokers who cannot, or who do not want, to quit. This comprehensive approach should empower and support smokers. It will also enhance the benefits of e-cigarettes, compared with an approach that focuses only on making e-cigarettes more widely available. The Plan includes measures that consider future generations and society as a whole by protecting future generations from the risk of becoming smokers, and protecting non-smokers, including children, from exposure to second-hand smoke. The Plan sets out an ongoing monitoring and review framework to ensure that positive impacts and any unintended adverse consequences are identified and quantified, and the Plan modified if necessary to ensure the maximum progress is made towards achieving a Smokefree Aotearoa by 2025. Achieving the Smokefree Aotearoa 2025 goal will represent one of this country’s greatest public health and social justice achievements – particularly for Māori, who disproportionately suffer the burden of the tobacco epidemic. Implementing the Plan will empower the majority of current smokers who are regularly trying to quit, and support them as they strive to realise their goals. It will also empower the people of Aotearoa, who overwhelmingly support the Smokefree 2025 goal, by establishing a tobacco-free country in which their children and future generations are protected from addiction and the entirely avoidable suffering caused by smoking. Hajek P. Electronic cigarettes have a potential for huge public health benefit. BMC Med 2014;12:225. McNeill A, Brose LS, Calder R, et al. E-cigarettes: an evidence update. A report commissioned by Public Health England, 2015. Hartmann‐Boyce J, McRobbie H, et al. Electronic cigarettes for smoking cessation. The Cochrane Library. Bullen C, Howe C, Laugesen M, et al. (2013). Electronic cigarettes for smoking cessation: a randomised controlled trial. Lancet, 382(9905), 1629-1637. Yong, HH, Hitchman SC, Cummings KM, et al. Does the regulatory environment for e-cigarettes influence the effectiveness of e-cigarettes for smoking cessation? : Longitudinal findings from the ITC Four Country Survey. Nicot Tob Res (published online, April 5 2017). Zhu SH, Zhuang YL, Wong S, et al. E-cigarette use and associated changes in population smoking cessation: evidence from US current population surveys. BMJ 2017;358:j3262. Beard E, West R, Michie S, et al. Association between electronic cigarette use and changes in quit attempts, success of quit attempts, use of smoking cessation pharmacotherapy, and use of stop smoking services in England: time series analysis of population trends. BMJ 2016;354:i4645. West R, Shahab L, Brown J. Estimating the population impact of e-cigarettes on smoking cessation and smoking prevalence in England. Addiction 2016;111:1118-19. Cherng ST, Tam J, Christine PJ, et al. Modeling the effects of e-cigarettes on smoking behavior: implications for future adult smoking prevalence. Epidemiology 2016, 27: 819-26. Wilson N, Edwards R, Weerasekera D. High levels of smoker regret by ethnicity and socioeconomic status: national survey data. N Z Med J 2009;122(1292):99-100. Ministry of Health. Tobacco Use 2012/13: New Zealand Health Survey. Ministry of Health: Wellington, 2014. US National Cancer Institute and World Health Organization. The Economics of Tobacco and Tobacco Control. National Cancer Institute: Bethseda, MD, 2016. Hoek J, Smith K. A qualitative analysis of low income smokers’ responses to tobacco excise tax increases. Int J Drug Policy 2016;37:82-89. Cowie N, Glover M, Gentles D. Taxing times? Smoker response to tax increases. Ethn Inequal Health Soc Care 2014;7(1):36-48. Edwards R, Thomson G, Wilson N , et al. After the smoke has cleared: evaluation of the impact of a new national smoke-free law in New Zealand. Tob Control 2008; 17:e2. This entry was posted in Uncategorized and tagged e-cigarettes, Smokefree Aotearoa 2025, tobacco control, vaping by dayhi34p. Bookmark the permalink.